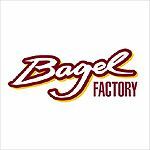 If you're a bagel lover you'll be spoilt for choice at the Bagel Factory, where the menu includes breakfast bagels, hot melts and traditional favourites. Nice, soft bagels here. Plenty of fillings to choose from - marvellous.